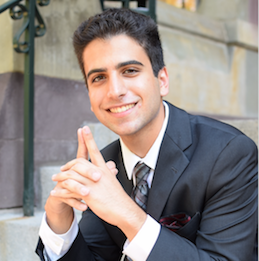 Originally from Cincinnati, OH, Omar is a senior (C’19) at the University of Pennsylvania double majoring in Modern Middle Eastern Studies and English, with a minor in Civic Studies. Born in Jordan to parents who are descendants of refugees, Omar is passionate about refugee and immigrant rights and policy, and he hopes to pursue these passions through a career in law. Omar has interned at the Human Rights Department of the Center for Strategic and International Studies (CSIS), researching democratic backsliding, civil society regression, and refugee education policy. In addition, Omar volunteers as a peer mentor through the Junior Jumpstart college preparatory program and is a camp counselor for youth programs at the Cincinnati Observatory. In his free time, Omar loves to write poetry and prose, travel, and explore his passion of astronomy.